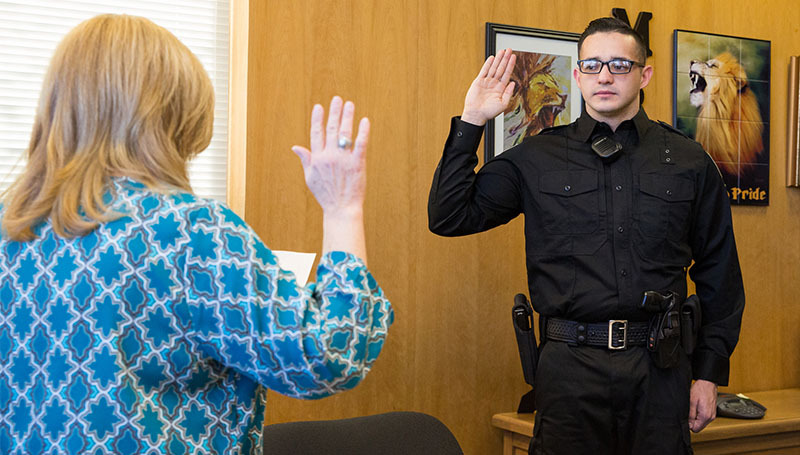 With the oath taken, Dwayne Rice became the newest member of the University Police Department during a swearing-in ceremony held Wednesday, Jan. 9, in Hearnes Hall. A career in law enforcement was something that interested him after he got out of the military, Rice said. As an officer with the Springfield Police Department, he could be seen in an episode of A&E Network’s “Live PD” – which follows officers from departments throughout the United States. Rice became the second veteran of the Springfield Police Department to join Missouri Southern in recent weeks, said Ken Kennedy, chief of the University Police Department. Officer Stephen Sloniker also joined the department during a ceremony held last month.